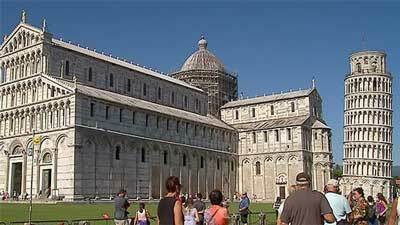 (Nanowerk News) Just a few meters from Pisa’s famous Leaning Tower, restorers are defying scorching temperatures to bring back shine to the city’s Cathedral. “Marble has very low porosity, which means we have to use nanoparticles in order to go deep inside the stone, to ensure that the treatment is both efficient while still allowing the stone to breathe,” explains Roberto Cela, civil engineer at Opera Della Primaziale Pisana. The material developed by the European research team (Nano-Cathedral project includes calcium carbonate, which is a mix of calcium oxide, water and carbon dioxide. The nanoparticles penetrate the stone cementing its decaying structure.